This highly invasive plant is found in almost every state in the U.S. and in Canada. If you’ve found it in your pastures or ranges, here’s some good news about controlling its spread while turning it into a nutritious forage. If spotted knapweed (Centaurea maculosa) has popped up in your pasture, we recommend using it as forage. It is quite nutritious, ranging from an alfalfa-like 14-19% protein in the rosette stage, and 10-12% when bolting. Its primary toxin, cnicin, does not have a great effect on how much spotted knapweed animals eat and does not cause any health issues. Grazing it in bolting stage has been demonstrated to reduce seed viability by 90%, and successful grazing projects in the West have shown that a little persistence really pays off. Examples of grazed spotted knapweed. The stem ends are grazed off the top plant, and leaves are stripped from the stems of the bottom plant. Sheep and goat grazing is often prescribed for spotted knapweed control. Sheep have even chosen knapweed over a plethora of so-called desirable forages, among them orchardgrass, timothy, quackgrass, bluegrass, and birdsfoot trefoil. 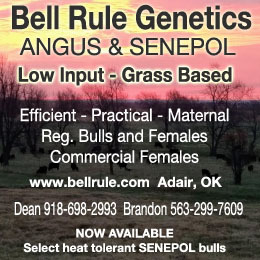 But if you have cattle, they can do just as well on the plant. 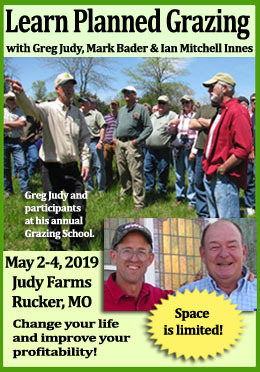 In 2004, this was one of the first plants that Kathy Voth taught cattle to eat. She says its very easy to teach cows to eat spotted knapweed, particularly when she begins in the bolting stage when the plants are easy to clip, and trainees take to it very quickly. In pasture, animals clip off stems and leaves. Sometimes they root out and eat the center area of the plant first, and then move on to the stems. What’s the best time to graze? This graph shows how much spotted knapweed, native forbs and grasses were grazed at high and low stocking rates for the months of June, July and August in a study done by Dr. Karen Launchbaugh. Since spotted knapweed is a biennial or short-lived perennial, if you’re interested in reducing the amount you have in pasture, you’ll want to graze it to prevent seed production, while not putting extra pressure on the native grasses and forbs in your pasture. 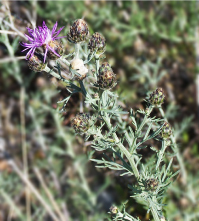 A 2007 study done by Karen Launchbaugh indicated that in Idaho, July is a good time to hit spotted knapweed hard. Because it is more palatable then than the native forbs and grasses, cattle focus more on spotted knapweed. 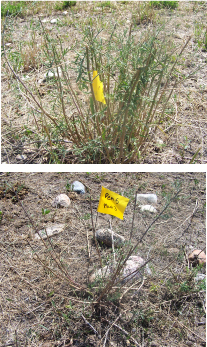 If you’re not in Idaho, look at your plants to tell you when to work on knapweed. Since green and growing plants are always more nutritious than plants in later stages of maturity, you’ll know that you can focus on spotted knapweed when it is green and the grasses are in seed. How do we know that grazing will help? A 2008 clipping study found that clipping during bolting stage reduced viable seeds by nearly 90% compared with no clipping. That means that if you graze your knapweed hard, you’ll significantly reduce the seed bank. Keep in mind, that if you’ve had spotted knapweed for some time, you might have a pretty good seed bank. So you’ll need to keep grazing every year if you really want to get rid of spotted knapweed. 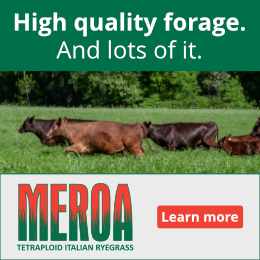 That’s not such a bad thing though if you remember that every bite of spotted knapweed your cattle eat is just as good as a bite of alfalfa! Here’s what a spotted knapweed flower looks like. Aside from its nutritional benefits, spotted knapweed has both positive and negative effects on its environment. It is a nectar source for some native butterflies and provides nectar and pollen for bees. On the down side, it contains lactones that, under laboratory conditions, inhibited germination and root growth of nearby native grasses, trees, and weeds. Spotted knapweed has medical benefits as well. It has been used to heal wounds, as a snakebite remedy, and as an appetite stimulant. And, while this might not make it into your medicine cabinet just yet, extracts from the plant have been shown to have some effects fighting cancer. Last but not least, for those of you still looking for that special someone, keep in mind that young women once wore spotted knapweed flowers to attract bachelors. So if you see someone giving you a special look while holding some knapweed, take the hint!